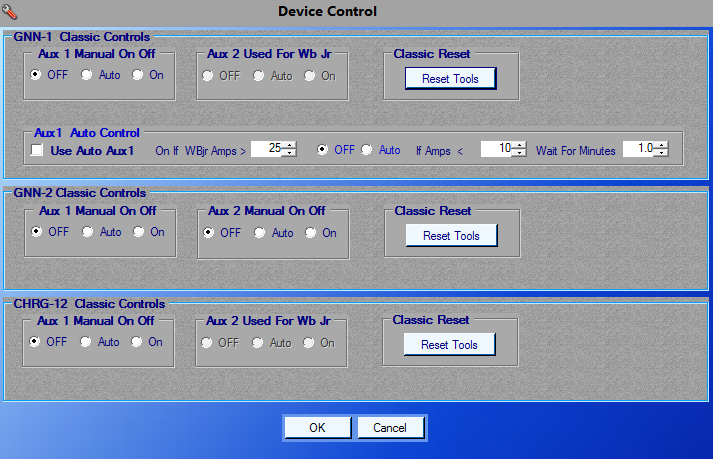 Aux 1 and 2 Controls Are instant Click Its done. Make Sure you know what Function Aux 1 & 2 are set for very rarely will On Mode be used. Click " Reset Tools " A new window will appear. Once Clicked there is no recovering the Data !!! To Clear a Classic Log "Right Side"
Simply Click the Button for The Log you want to Clear . The Log will be set to 0 or Nothing. Make Sure you are Clearing the Log you want !!! 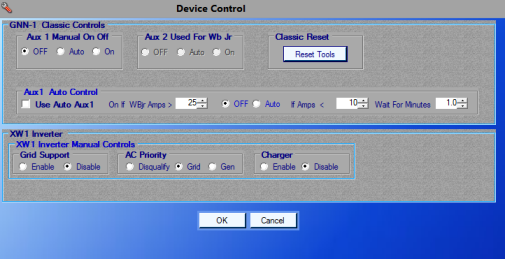 Allows for Aux 1 Dump load Based on Max Amps & Min Amps When WbJr Is Installed. If (Amps To Battery greater than (x) Amps) Set Aux 1 To (On), When (Amps To Battery Less than (x) Amps) Wait For (x) minutes Set Aux 1 To (Auto Or Off). Warning !!! Use These Controls, At Your Own Risk !!! Be Very Careful With These Controls !!! Improper settings or Values Could DESTROY YOUR XW Inverter or DESTROY YOUR BATTERIES !!! Or Worse Cause A FIRE !!!. The user agrees to defend, indemnify and hold harmless Copyright holders from any and all damages, claims, suits or expense resulting from use of this.
" 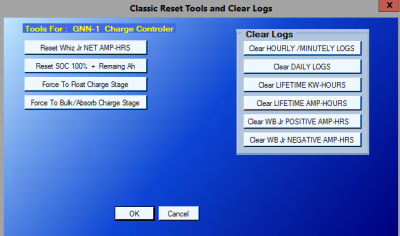 XW AC In Priority "
" XW Charger Mode "
Improper settings or Values Could DESTROY YOUR OUTBACK or DESTROY YOUR BATTERIES !!! Or Worse Cause A FIRE !!!.
" 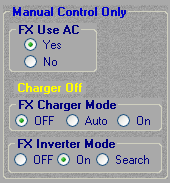 FX Use AC "
" FX Charger Mode "
" FX Inverter Mode "
This Function Uses the FX Inverter Battery Voltage not the Classic's Voltage. AND (Less than (x) Volts For (x) minuets. Note : Due to the Slowness of the AXS in Changing Charge modes It ma take 1 or 2 Update cycles for the main program window to show the proper Inverter State. Waning Setting values to close Can Cause Rapid Cycling !!! This Function Is Deigned Mostly For BackUp Systems with Solar, Where the Charger is normally off. It also sets the FX charge mode to Auto when Charging So all FX Auto Charge rule apply And overrule . If Battery volts is (Greater than (x) Then Charger for (x) More Minuets .